Sandy Bridge is the new line of processors from Intel. It’s the second generation of Core i3/i5/i7 processors and is an evolution of the previous Nehalem architecture. 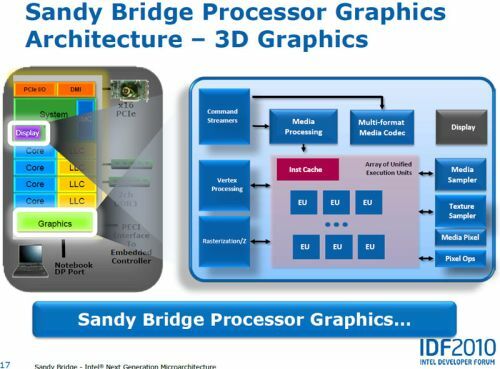 Sandy Bridge integrates a multi-core CPU and a GPU on the same silicon die. The GPU part of Sandy Bridge comes in two flavors: Intel HD 2000 Graphics and Intel HD 3000 Graphics. Sandy Bridge Core i3/i5/i7 use a LGA 1155 sockect. 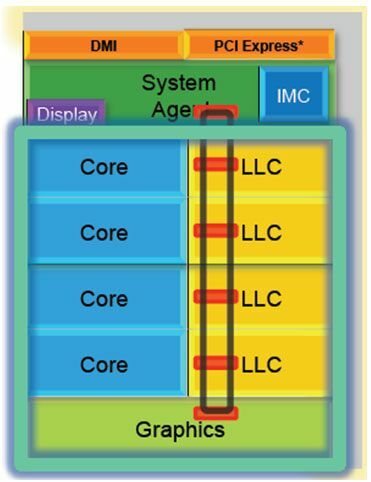 The Intel HD 3000 Graphics has 12 GPU cores or 12 EUs (EU = Execution Unit in Intel terminology), while the HD 2000 has only 6 EUs. The default clock speed of both HD 3000 and HD 2000 is 850MHz. i7-2600K and i7-2600 can run up to 1350MHz while all other i5/i3 can run at a max clock speed of 1100MHz. 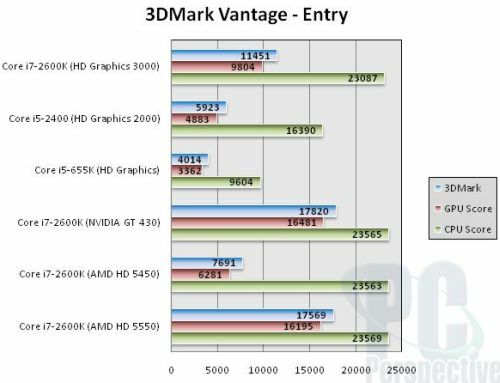 Just to give you an idea, Intel HD Graphics 2000/3000 GPUs are in the same range of prestation than Radeon HD 5450 / HD 5550 or GeForce GT 430 GPUs. 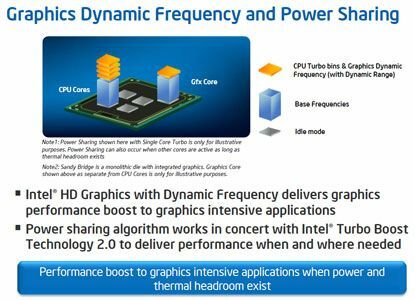 Intel HD Graphics 2000/3000 are OpenGL 3 and Direct3D 10.1 capable GPUs (while Radeon HD 5450 is a DX11 capable GPU). 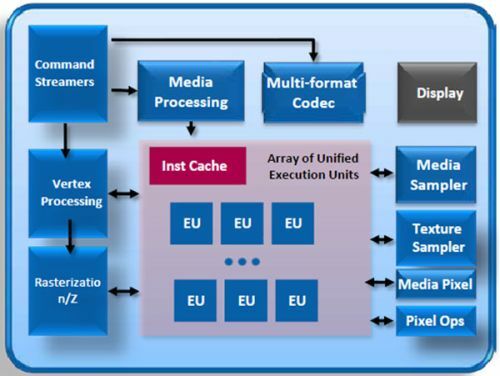 Sandy Bridge GPU shares the LLC (or Last Level Cache, new name of the L3 cache) with the CPU execution units. Another new thing in Sandy Bridge processors is that, if the CPU cores are only slightly loaded, the clock speed of GPU cores is automatically overclocked to the max value (1100MHz or 1300MHz, depending on the CPU model). This kind of CPU will eat all desktop market for office use.. nice move. 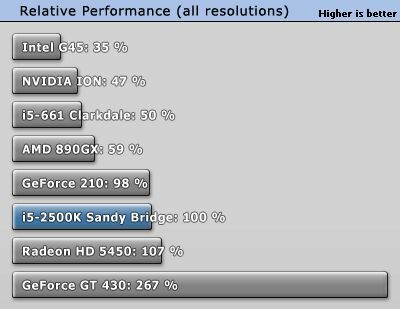 Finally decent opengl support from intel. Given that these aren’t Intel’s first OpenGL 3-capable GPUs, does this mean that their current DX10.0 will also gain OpenGL 3 support, or will OpenGL 3 support be restricted to DX10.1 capable processors?